Easy and long lived. Inset and disease resistant. Can be divided in spring or fall. Long blooming. good cut flower. 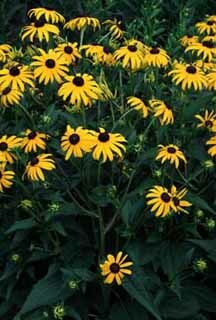 This is the classic Black-Eyed Susan � daisy-like flowers with bright yellow petals and deep brown centers. The "Goldstrum" variety grows about 2 feet tall and flowers from midsummer through mid fall. Rudbeckia tribloba originates from a native species and is taller at about 3 feet and has a more branching habit. It blooms from late summer right through to hard freezes. Both are spectacular planted in masses or in wildflower gardens where they will sow quite readily. They make a nice late summer flowering addition in mixed borders and are excellent cut flowers. Rudbeckias perform best in full sun but can take a part sun situation (5 to 6 hours of sunlight a day will ensure good flowering). Overcrowding can be prevented by dividing every 2 to 3 years. This is best done in the spring.